Crystal Beach Florida: You’ll think you are on Gilligan’s Island, a million miles away from the rest of the world, on this small beach that boasts great fishing and fabulous sunrises and sunsets. If you happen to be in the market for a small beach town where you can be alone to meditate or just decompress, come on down. Don’t blink driving through, you might miss it- and you wouldn’t want to miss out on a very private (yet public) beach where you can be alone with the sun and sand. This is almost a spiritual experience. Beautiful Crystal Beach at sunset. Other popular activities on Crystal Beach Florida include swimming, shelling, snorkeling, sandcastle construction, fishing and kayaking. There are beautiful sunrises and sunsets here, too, and fabulous food if you happen to love fish cooked by pros. 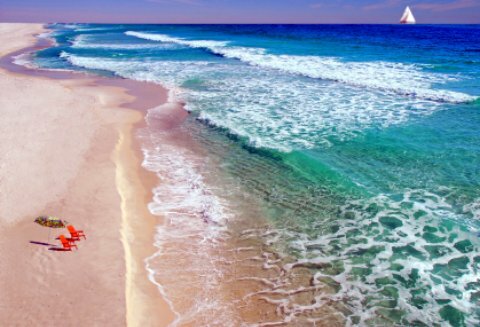 Be sure to check out Destin and explore some of the beaches in Northwest Region; after all, they are touted to be the World's Best Beaches. This is the Emerald Coast, after all! Enjoy a quiet picnic while watching the natural spring at the recently developed Wall Spring Park. Saunter on over (as after relaxing so much you’ll probably move at a snail’s pace!) to Henderson Beach State Park to enjoy a truly breathtaking beach as well as nature trails and a picnic area. Venture a little off the beaten path to the Village of Baytowne Wharf where you can shop till you drop while the kids hang out on the playground. Suncoast Primate Sanctuary where You can see lots of primates in all shapes and sizes. Also, a celebrity awaits your presence; none other than “Cheetah” from the classic Tarzan films. Eating: Adults might enjoy a fun meal at Thirsty Marlin Grill and Bar. Enjoy an outdoor meal at Mojo’s in Palm Harbor, which is right next door to Crystal Beach.